Where else other than a PB event would community projects offer each other the free use of a hearing loop, a spare couple of desks for working at and hens for a sensory garden? All this and more was going on at the Money £or Moray PB event in Rothes on Saturday the 25th March 2017, and PB Scotland was there to soak up the good vibes! Money £or Moray is a Working Group of 17 volunteers from across Community Councils, Area Forums and Village Halls and Associations in Moray, who came together in early 2016 to design and deliver a pilot participatory budgeting grant scheme delivered in May and June 2016. The March 2017 event saw £40k from the Scottish Government’s Community Choices fund put towards tackling social isolation across Moray. More than 150 local people attended the public voting event in the appropriately named Grant Hall to watch presentations from 18 groups across Moray on what they would do to tackle social isolation. Kevin Stewart, Minister for Local Government & Housing, was in attendance and outlined the Scottish Government's commitments to PB up till now, emphasising that community-led events such as this will continue to be a focus in the future. Pitches included Moray Reach Out requesting £4000 towards providing training opportunities to adults recovering from mental health issues and Alves Primary Parent Council asking for the same amount to upgrade a store room at the school into a creative space for pupils and the wider community. People were given voters packs on the way in the door with information on each of the applicants and what they were requesting. After watching the presentations, they were asked to select 10 of the 18 projects that they wanted to see supported. Voting slips were then placed in a ballot box, before a count took place upstairs while participants ate lunch. 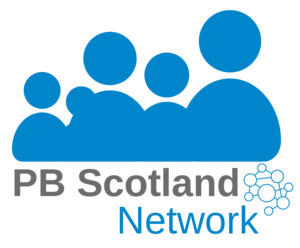 PB Scotland spoke to both participants and projects who each saw the positives of PB. William, who was presenting as a member of Keith and District Men’s Shed said it was a “great way to distribute money fairly to organisations”. The group was at an early stage, hoping to establish a Men’s Shed in Keith, and this was also William’s first involvement at any sort of funding event and therefore a chance to discover what else was going on locally. Similarly, Rachel from Alves Primary Parent Council said that the event was “brilliant as it makes it fair and gives people a chance to have a say instead of anonymous people”. The Minister congratulated Moray for embracing Community Choices budgeting and working in partnership to make it such a success. The Money £or Moray working group clearly put a lot of thought and effort into running as smooth a PB process as possible. The theme of social isolation worked well and a good selection of projects were available to choose between. In all, 58 groups in total had applied to the scheme, which was whittled down to 18 who presented on the day. Given that thirteen projects ended up being funded, this left 45 local projects who didn’t receive funding through the PB event. This may seem like a lot of disappointment, but it also means that a more meaningful vote takes place than if every project goes away with a bit of funding. It was also encouraging to meet someone who was participating in the event as a voter despite their own application being rejected. Being well-organised can also have unintended consequences. Presentations were strictly kept to two minutes for reasons of fairness, with time being freed up for questions from the floor after each pitch. However, there were fewer questions than anticipated, which led to the event being 45 minutes ahead of schedule at one stage. Fortunately, this wasn’t a problem on this occasion, since other parts of the day (including a delicious lunch!) were able to be shifted around. The most striking feature of the day was the number of projects who, after presenting their ideas, were offered support by others in the room. Firstly, someone from a local church offered the free use of a hearing loop to Garmouth and Kingston Over Fifties Club who were bidding for money to buy a microphone. Then, Cathay Residents Association were offered chickens for their sensory garden. Finally, Keith and District Men’s Shed were offered the use of desks by one attendee. The March 2017 Money £or Moray event was well organised yet friendly with a lot of humour, both from presenters and from the floor. The theme of social isolation seemed to work well, and it is interesting that the PB process itself was so socially connecting. As PB Scotland has witnessed at PB events across Scotland, the benefits from PB would appear to be about a lot more just the money.